Leaf me alone: a gutter guard is quite simply the easiest way to keep leaves from clogging and damaging your gutters and downspouts. Every year, you spend time standing on a ladder wrestling leaves from the gutter, and every year, you think that there must be a better, more efficient way to complete this task. There is. Fall is beautiful. Keep your gutters looking gorgeous too with Harry Helmet’s Gutter Helmet gutter guard. With a gutter guard, you’ll eliminate the time you spent removing leaves from your gutters, and you’ll rest assured knowing that your gutters will run clean and clear all year round. Better gutter drainage means fewer problems with landscape erosion and leaks from water that’s cascading from your gutters. It also means that your gutters remain free of pests such as wasps during the summer months. A gutter guard from Harry Helmet® will make your seasonal maintenance simpler as you remove one item from your annual list. Learn more about our gutter guards by downloading our Gutter Guards Guide today. How do gutter guards work? The idea is simple, yet it’s very effective. Instead of having a gutter that’s open and filling up with debris, your gutter gains a roof that shelters it from leaves and other seasonal debris. Water flows down the gutter cover into the gutter, clinging to the gutter as it runs down. Harry Helmet’s gutter guards are designed to last, with two customized brackets and a Permalife textured coating surface that won’t fade or chalk. Curious to know what a gutter guard would look like on your home? Take a look at our photo gallery. Gutter guards come with a cost, but so do the problems associated with traditional gutters. 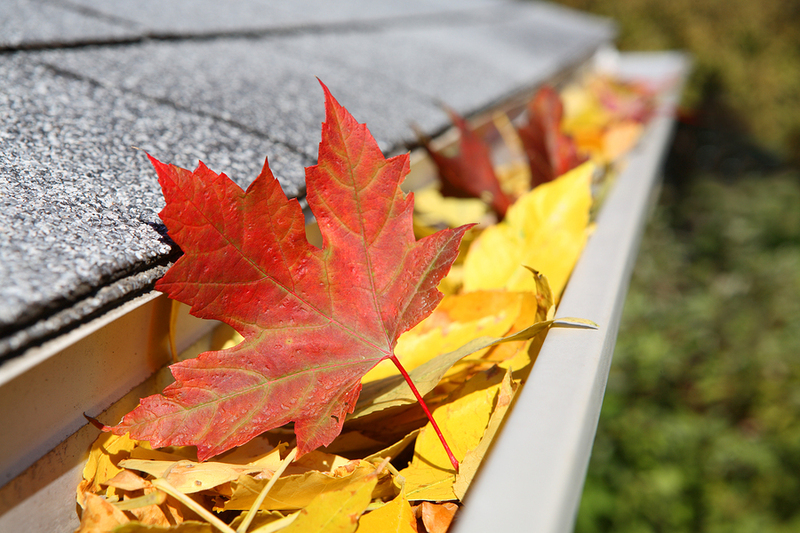 Traditional gutters can fill with leaves, causing trouble with pests, damaged gutters, and overflowing water that spills over, causing erosion and placing water exactly where you don’t want it: near your home’s foundation. If you’re not able to clean your gutters yourself, you need to hire someone to do it. Installing a gutter guard will cost you money upfront, but you need to look at the benefits of this investment. Every year, you’ll avoid spending multiple times on gutter cleaning, a cost of over $2000 over a five-year period. You’ll also avoid water damage to your siding, landscaping, and foundation. Most of all, you won’t need to worry about spending the time up a ladder, something that can lead to personal injury. When you think about it, the return on your investment could be even greater! Gutter guards are perfect for your home and lifestyle. They make your home look tidy, protecting and maintaining your gutters. They reduce the amount of time you need to spend on unpleasant maintenance tasks, increasing the time you have to enjoy your garden. They’re also compatible with green living technologies such as rain barrels, ensuring that the water that enters the rain barrel is clean and clear. Gutter Helmet® gutter guards are compatible with other gutter protection products such as Helmet Heat®, keeping your gutters running efficiently all winter long. If you’re considering a gutter guard, who will you work with? Harry Helmet® has established itself as the largest U.S. dealership of the revolutionary Gutter Helmet® Gutter Guard System since 1981. We’re a family owned and operated business that has expanded to work in nine states, and we have served over 100,000 households. We’re proud to say that our products are manufactured in the United States and are made from a 99% recycled high strength aluminum alloy. Would you like to see what customers are saying about us? Take a look at our Gutter Helmet reviews. Are you ready to get started on your gutter guard project? Harry Helmet’s Gutter Helmet installers are ready. Contact us today to learn more about the products and services that are available in your area.